OnlyWatch is a biennial charity auction of specially-designed, one-off pieces from some of the best watchmakers and manufacture in the world in aid of research into Duchenne Muscular Dystrophy. The auction is organised by Association Monégasque contre les Myopathies, the Monaco Yacht Show and Phillips in association with Bacs & Russo. It’s a good cause, and showcases some remarkable pieces, from names including Christophe Claret, De Bethune, F.P. Journe, MB&F, URWERK, Kari Voutilainen, Peter Speake-Marin and Tudor. From September 23rd until November 7th, the 44 watches are taken on a tour that spans the globe: Monaco, Hong Kong, Beijing, New York, London and Geneva, and in doing so, they pass through a great many pairs of hands. A few weeks ago I received an invite from Phillips and Tudor UK to view the watches, and in particular the latter manufacture‘s unique offering, designated ref 7923/001. This watch is a version of the incredibly successful Tudor Heritage Black Bay, but echoing two early Submariner references: the red triangle-marked bezel of the 7922; and the pencil hands and gilt dial of the 7923. 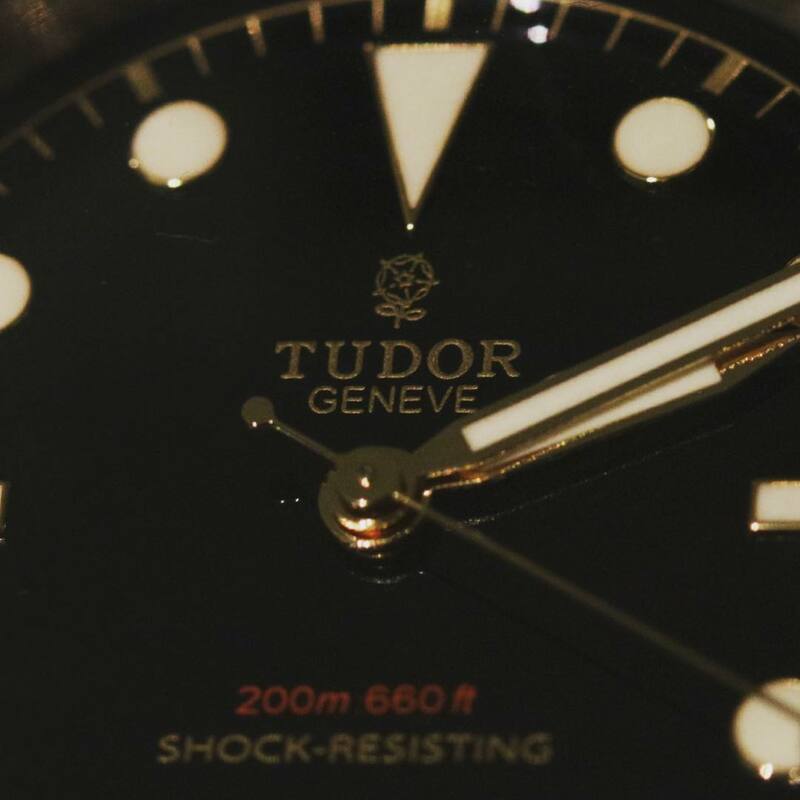 It’s a lovely thing, and one that rides the crest of a rather successful wave for Tudor: their re-entry into the US and UK markets in particular has been met with almost universal welcome (as has the production version of the 7923/001, the Black Bay Black). Tudor appears to have bridged the gap between vintage and modern in a very effective manner**: like Longines, Omega, Oris and others, the brand is drawing on a rich history, influenced not only by its own watches, but also by its wealthy and influential parent. There is in the 7923/001 a hint of something else. A link to the wider Rolex family, perhaps. Membership of something bigger. Coincidentally, as I received the invite, a friend and fellow ‘blogger (Horologium) was at Watches and Wonders in Hong Kong, where the OnlyWatches had just arrived from Monaco. We joked that the pieces that were being displayed, photographed, written about and generally abused by journalists would shortly be in London, and that we would both be doing exactly the same thing to the same unique and potentially very valuable pieces, but separated by time. We’re used to global embargoes and launches of watches; simultaneous events organised across geographies, national boundaries and territories. We often see a watch in London at the same time as it’s released in New York, Singapore or Sydney. Then there’s the usual race to get something online – that speed-to-market / first mover advantage to which so many subscribe. Photos are Bluetoothed from camera to ‘phone or laptop, edited, cropped, uploaded and shared. So many bodies, all trying to do the same thing, at the same time, apart. But we so rarely get to see the same watch. Perhaps the OnlyWatch tour allows us to connect, not only through our mutual respect for the organisation and its goals, but also through the unique watches themselves. It’s been a strange week. I’ve been thinking a lot about the passing of time since I heard the heart-breaking news that Professor Lisa Jardine had died on Sunday. Amongst a great many other things, she was President of the Antiquarian Horological Society, and though I only met her twice, I was greatly saddened by her death. If you do get a chance to see the OnlyWatches in Geneva before the auction (5-7 November 2015), I doubt you’ll be disappointed. And please give Melchior a hug from me. DISCLAIMER: I was the guest of Phillips Auctions and Tudor UK. The latter very kindly treated me to dinner (including alcohol), as well as giving me a parting gift of a Tudor-branded tie pin and leather key tray.